And what does"eschatological"mean, and what has it got to do with the events taking place on Earth? Without question Jesus' sending of the Comforter was to be a futuristic eschatological event. Without question the Comforter will have to be human in order to teach all things and remind humanity of everything Jesus has said. Without question the Comforter will have to incarnate on Earth, where humans live, in order to enlighten them. Without question the Comforter will have to be the Holy Spirit too, if Jesus is to be believed. Without question these exacting biblical eschatological expectations, events and signs have already manifested on Earth. Thus any arrogant or ignorant human who blasphemes the Holy Spirit Shri Mataji Nirmala Devi—sent by God Almighty in the name of Jesus to both enlighten and warn humanity—will never ever be forgiven. 2 : a belief concerning death, the end of the world, or the ultimate destiny of humankind; specifically : any of various Christian doctrines concerning the Second Coming, the resurrection of the dead, or the Last Judgment"
So be clearly forewarned! This explicit warning is not only for Christians to heed but the rest of humanity as well. It is far better they remain silent as there is absolutely no forgiveness for those who blaspheme the Holy Spirit, an unpardonable crime against God Almighty for causing injury to His Spirit by false accusations. Again, be amply forewarned! "But the Fathers of the Church, commenting on the Gospel texts we are treating of, did not confine themselves to the meaning given above. Whether it be that they wished to group together all objectively analogous cases, or whether they hesitated and wavered when confronted with this point of doctrine, which St. Augustine declares (Serm. ii de verbis Domini, c. v) one of the most difficult in Scripture, they have proposed different interpretations or explanations. Sometimes, and in its most literal signification, it has been taken to mean the uttering of an insult against the Divine Spirit, applying the appellation either to the Holy Ghost or to all three Divine persons. This was the sin of the Pharisees, who spoke at first against"The Son of Man", criticizing the works and human ways of Jesus, accusing Him of loving good cheer and wine, of associating with the publicans, and who, later on, with undoubted bad faith, traduced His Divine works, the miracles which He wrought by virtue of His own Divinity. The above explanation is the best the Catholic scholars could conjecture. Yet it makes little sense and leaves many questions unanswered. In fact it creates more confusion and doubt than enlightenment and faith - try reading it with deliberation and you will understand what i am trying to say. vii) The Comforter—whom the Father will send in Jesus' name, and teach all things and remind humanity of everything Jesus has said—will be the Holy Spirit (John 14:26). Thus the personality enlightening humanity of Jesus' teachings will be both the Comforter and Holy Spirit sent by God Almighty in Jesus' name. 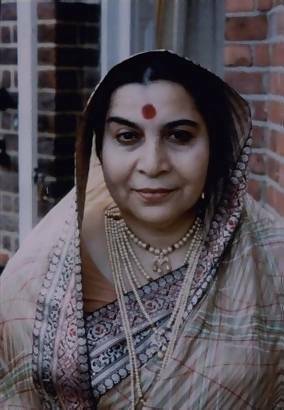 Shri Mataji is the Comforter, the Helper or Paraclete who has for more than three decades glorified Christ and-through Her Divine Message of the Last Judgment and Resurrection-guided mankind into all truth. All who receive their second birth by the Spirit (Self- realization) experience today what Jesus' disciples experienced two millennia ago on the day of Pentecost. The awesome, fundamental difference between both phenomena is that the present experience of the Holy Spirit manifesting within humans was promised by Lord Jesus ..... and is taking place all over Earth. This truth is irrefutable as hundreds of thousands have felt it. The tens of thousands who continue to meditate on the Holy Spirit within feel it on a daily basis. Some even experience the Ruach on a 24/7 basis! In the Gospel of St. John, Jesus tells the disciples of the Holy Spirit that will come in his name and shall bring all things to their remembrance. That verily has been accomplished by the Holy Spirit over the last three decades! Only then would it have made sense to Christians, their scholars, clergy and churches that the Comforter - whom the Father will send in Jesus' name, and teach all things and remind humanity of everything Jesus has said - will _also_ be the Holy Spirit (John 14:26). Without all this information and evidence that Jesus' promise has been exactingly fulfilled by the advent of Shri Mataji, the doctrine of blasphemy against the Holy Spirit will remain a most difficult doctrine for Christians to comprehend, as has been the case for more than 20 centuries! But that is nothing compared to them being unaware or disbelieving that the Last Judgment and Resurrection is taking place, a Divine Message that the Comforter was entrusted to declare without any fear or hesitation. Just like the doctrine of blasphemy against the Holy Spirit, the doctrine of the Last Judgment and Resurrection has also been a most difficult doctrine to comprehend. Most unfortunately, both have been conjectured over the centuries by humans devoid of enlightenment. That is why the Savior promised two millennia ago that He will send the Comforter, the Holy Spirit who explain, testify, declare, warn and remind humanity of everything Jesus has said. “In between Jesus Christ and His destroying Incarnation of Mahavishnu called as Kalki there is time given to human beings to rectify themselves, for them to enter the Kingdom of God which in the Bible is called as Last Judgment, that you will be judged. All of you will be judged on this Earth. The population of the Earth is at the maximum these days because all those, practically all those who had aspirations to enter into the Kingdom of God, are born in Modern Times and are going to be born very soon. This is the most important times because Sahaja Yoga is the Last Judgment. It is fantastic to hear this but that's the fact. It's the Truth. a doctrine openly declared in public by the same Holy Spirit month after month, year after year, for more than three decades .... and explained in private to the believers with so much motherly love, tenderness, patience and detail.